Think of it as divrei Torah for the Talmud. 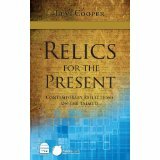 Rabbi Dr. Levi Cooper’s Relics for the Present is an innovative, insightful, and thoroughly practical look at Mesechet Brachot that is sure to provide inspiration for Talmudic newcomers as much as long-time scholars. Whether read cover-to-cover or piecemeal, whether you’ve ever studied Tractate Brachot, or any other part of the Talmud, you are sure to have no trouble finding meaning in this book. Moreover, for beginner students especially, Relics can serve as the perfect introduction to the personalities of the Talmud and of it’s many commentators. While in the Preface, Rabbi Cooper says he published his book on Tractate Brachot to coincide with the renewal of the Daf Yomi, or daily Talmud cycle,there seems to be more to the selection than this. If Tractate Brachot and its placement as the introductory section of the Talmud teaches us anything, it’s that the importance and problematics of Jewish prayer has not changed in the last 2,000 years. As such, Relics provides a refreshing modern voice in the ongoing Jewish conversation on how best to converse with God that should prove meaningful to Jews of all stripes. But Relic‘s insights are hardly limited to prayer. Like the Talmud itself, one of the treats of this book is the element of surprise—you never know what the next essay will be about and the sheer breadth of topics elucidated upon is astounding: How to greet someone, rear your children, the value of tears, revenge, who to marry, how to relate to dreams, the meaning of truth, where to sit in shul, the evolution of Jewish law, how to be a wise activist…these are just a few from the smorgasbord of life lessons to be gleaned from this relatively short book. The book’s biggest strength, however, may be how it serves as the perfect vehicle for Rabbi Cooper’s distinctive personality and background. Each essay first showcases his deep scholarship in the wide-range of opinions he places in discussion on each page in a conversation spanning time and space that’s worthy of the Talmud itself: In a single three-page essay, he is likely to quote parallel Rabbinic sources, Medieval commentators, Hasidic masters and tales, and contemporary sages. His legal background then shines through in his insightful analyses of the strengths and weaknesses of each commentator’s view. His experiences as a congregational rabbi and teacher then show in the fresh, original and relevant insights that close each essay. On page 35, Rabbi Cooper writes, “When we explore the Jewish library, we are both connecting to our past and looking to our future. We continue the traditions of old, while investigating its applications to the new….When we sit in the beit midrash [house of study] we strive to grow in two directions. We cultivate the roots that connect us to Sinai, while we search for the sunlight for today.” With Relics for the Present, Rabbi Cooper makes a significant stride towards helping all people direct their studies in this direction. Whether you are currently studying Tractate Brachot or not, by sitting in the beit midrash with Rabbi Cooper, the reader will cultivate roots deeply ensconced in the Jewish tradition while becoming empowered to join his search to illuminate it with the light of today.